It's the end of our first week house and petsitting in Winchester, England and we're enjoying our time with Poppy who is a 7.5-year old Golden Retriever. A total sweetheart she's kind, gentle, goodnatured, affectionate and in no time flat she's become John's shadow! She enjoys playing fetch the ball in the backyard and cherishes walking on the many scenic trails near her home. The views are breathtaking in town and on the outskirts. But like most of us she needs a little down time, so while she catches up with an afternoon nap we head into town to do some exploring. We had the best ever Sunday Roast lunch at The Black Boy pub. Click on the link above to get interior photos. It's quirky with a maze-like layout with all sorts of decorative knickknacks. To get back onto High Street we strolled along the park area and walkway along the Itchen River. Back on High Street we were drawn to Winchester Cathedral on Easter Sunday by its bells that could be heard from quite a distance. Tuesday we returned for a closer look inside and were fortunate to have guide Mike Cox by our side. He made its history come alive and explained the cathedral was build in an amazing 14-year period. Originally Norman in design it was renovated around 1280 in the Gothic style. Winchester was the original capital of England and when William the Conquerer arrived in 1066 he ordered his bishop to assert his power by building Winchester Cathedral. Then, as now, it is the longest intact medieval cathedral in the world. During Cromwell's reign his supporters barged into the cathedral through the double doors seen below on horseback with destruction in their hearts. Of course, King Henry VIII's men had beaten them to it years earlier and with few religious statues to destroy Cromwell's men opted to shoot out the stained glass windows and fire at random at any object in their path. The monks cleaned up the shards of broken glass and hid it. When Cromwell was finally ousted they repaired the westerly window as best they could. The two statues below, however, still show their battle scars. The first has a bullet hole between his legs. The second has a hole in his left thigh. 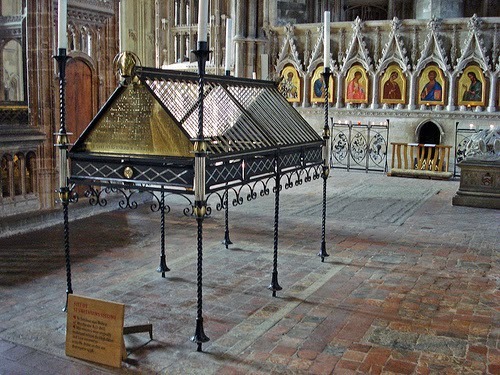 Another claim to fame of Winchester Cathedral is author Jane Austen is buried here. She died in 1817 and as her books were published using the aka "Written by a Lady" there is no mention of her ever having been a writer. That was rectified by her nephew a few years later who added the lower plaque below stating she was indeed an author. Later still, Jane Austen society members donated the upper memorial in her honour. The old Norman features (rounded arches on three floors) are still visible in the north transept. It is also here in the chapel to the right of the stairs that one of the earliest murals can be found. What's interesting is how colourful these images are. When first completed they must have been breathtaking to clergy, kings and peasants alike. Another interesting fact is the mural above was hidden from view for centuries as it had been covered by the mural below. Now they face each other in the chapel. In this same area is the exhibition for the Winchester Bible. Commissioned by William the Conquerer's grandson in 1160 it was written in its entirety by one scribe. The illustrations were completed afterward by six travelling professional freelance artists. The Winchester Bible is the largest and finest preserved of all 12th century English Bibles. Pilgrims entered via the north transept and walked down this hall to the shrine of St. Swithun. Born in Winchester in 800 he became counsellor to the Saxon kings Egbert and Ethelwulf and was Bishop of Winchster for the last ten years of his life. His body was originally buried in front of the west door of the Saxon Old Minster which is still visible via the brick outline next to the Norman Cathedral. Then one by one crawl into that small doorway called the 'Holy Hole' carrying a candle to view his remains. During the Reformation Henry VIII's henchmen smashed the shrine. His remains were scattered and never recovered. A modern day shrine is dedicated to his memory. Last but not least is the story of William Walker the man who saved the cathedral with his bare hands. In the early 1900s large cracks began to appear in the Cathedral walls as the foundation was sinking into the peaty soil near the Itchen River. An architect decided the only solution was to build new foundations, but the level of water deterred that plan until the project's engineer hired deep-sea diver William Walker to remedy the situation. For six long years he worked under the cathedral in 20 feet of water and with his bare hands excavated the flooded trenches and filled them with bags of concrete. Unfortunately he died in 1918 a victim of the Spanish flu epidemic, but the Cathedral is no longer in danger of collapsing. If you look carefully at the right side of this next photo you'll see how curved and swayed the stone columns had become. The floor also drops noticeably toward the far corner. During the entire tour with guide Mike Cox we were serenaded by a violin and piano concert. The music echoed throughout the Cathedral and was a perfect accompaniment to the experience. It's been a great week in Winchester...made all the more special because of sweet Poppy!